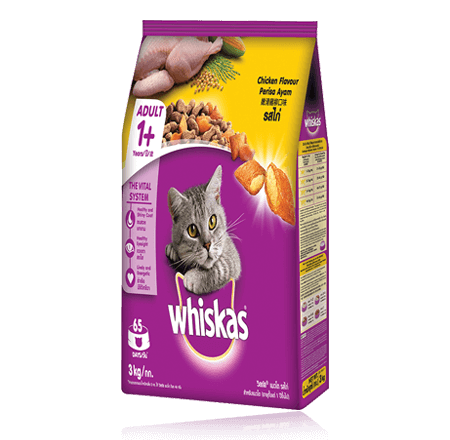 WHISKAS® Adult Dry Food with Chicken is made with a specific active ingredient and a specially designed kibble. 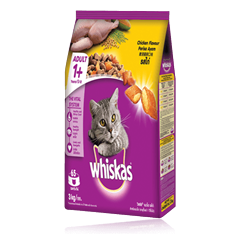 It provides a gentle abrasive effect to help clean your cat's teeth and support healthy gums. Wholegrain cereals (Corn, Wheat), Poultry and Poultry by product, Corn gluten meal, Soy bean product (Full fay soy bean, Soy bean meal), Vegetables oil (Palm stearin, Soy oil) , Dietary Fiber, Flavouring, Wheat flour, Minerals, Iodised Salt, colourants (Titanium Dioxide, Tartrazine, Sunset Yellow), Vitamins, Amino acid (Taurine, Methionine), Preservatives (Antioxidants, Potassium Sorbate).